Before leading the French army to victory at the Battle of the Pyramids on July 21, 1798, Napoleon Bonaparte rallied his troops by pointing to the distant pyramids and saying, “Soldiers, forty centuries look down upon you.” (1) Napoleon’s encounter with the pyramids during his Egyptian campaign led to at least three myths about him. The Battle of the Pyramids by François-Louis-Joseph Watteau, 1798-99. In reality, the battle took place so far from the pyramids that the latter were barely visible on the horizon. They were probably obscured by smoke once the fighting got underway. This conversation was reprinted in a book called Life of Buonaparte, First Consul of France, from his birth to the Peace of Luneville, translated from the French in 1802. There it was embellished with a description of how Napoleon reached the room within the Great Pyramid where the meeting took place. The story was repeated in several early biographies of Napoleon, including those by Willem Lodewyk Van-Ess (1809), Sir Walter Scott (1827) and William Henry Ireland (1828). The second myth has to do with a phantom called the Red Man. For more about the Red Man, see Was Napoleon superstitious? Instead, Napoleon amused himself by encouraging his companions to climb a pyramid under the hot Egyptian sun. “Who will get to the top first?” he asked. (7) The winner was the oldest of the contestants: 53-year-old mathematician Gaspard Monge. Monge had with him a gourd of brandy, from which he offered each of the others a generous sip as they reached the summit. Another myth says that Napoleon was responsible for the destruction of the Sphinx’s nose, having ordered his troops to use it for cannon target practice. 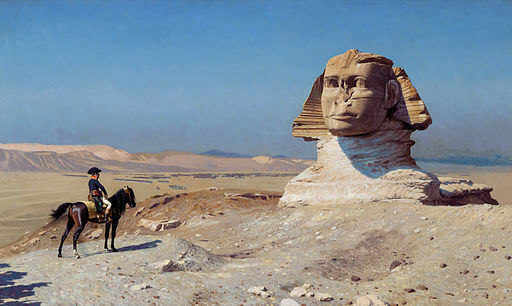 In fact, the Sphinx’s nose was gone long before Napoleon and his troops arrived in Egypt. See “Did Napoleon’s troops shoot the nose off the Sphinx?” by Tom Holmberg on The Napoleon Series. Napoleon Bonaparte, Correspondance de Napoléon Ier, Vol. IV (Paris, 1860), p. 340. As excerpted in The New England Quarterly Magazine, No. II (Boston, 1802), p. 139. The Atheneum; Or, Spirit of the English Magazines, Volume I (April to September 1817), pp. 731-732. See, for example, Allen Drury, Egypt: The Eternal Smile (New York, 1980), p. 254. Louis Antoine Fauvelet de Bourrienne, Private Memoirs of Napoleon Bonaparte, During the Periods of the Directory, The Consulate, and the Empire, Vol. I (Philadelphia, 1831), p. 208. Étienne Geoffrey Saint-Hilaire, Lettres Écrites d’Égypte (Paris, 1901), p. 236. Olympe Audouard, Les mystères de l’Égypte dévoilés (Paris, 1865), p. 335. Another absolutely fascinating and well researched article, always a delight to read what you have posted each week. Thank you, Lally. So glad you’re enjoying the posts! Fascinating article. Thank you for rekindling my interest in Napoleon. On to more reading about this man and his times! Thanks, Susan. Glad you liked the article. I hope you enjoy your Napoleonic explorations! Excellent article! My dad, in my youth passed on the myth of Napoleon’s cannoneers blasting the nose off the Sphinx. I have long since learned that this was not so. Also, learned that the battle of the pyramids was a good distance from those structures, though they could still be seen, as opposed to contemporary illustrations which depicted the pyramids a stones (cannon ball shot ?) throw away. Thanks, Charles. 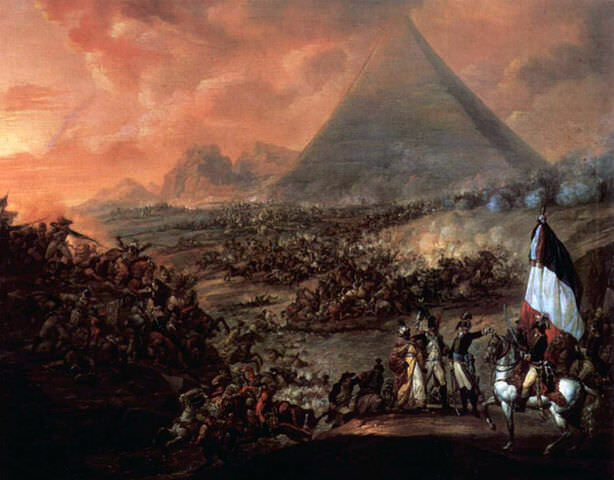 Yes, “Battle of the Pyramids” is rather a misnomer – Napoleon’s idea to call it that, apparently. And the paintings do look striking. It was a secured scientific expedition. Nelson nixed it. Napoleon was also turned back at Acra where he lost his best engineer, Cafarelli. It looked like tracing the footsteps of Alexander The Great. Thanks for your comments, John. There’s a good online exhibition about Napoleon and the scientific expedition to Egypt on the Linda Hall Library (Kansas City, MO) website: http://napoleon.lindahall.org/. Absolutely love the info you focus on with your posts. Great stuff! Shannon: I was having lunch yesterday with a fellow pedagogue who blithely related the “Napoleon inside the pyramid” story as gospel truth, replete with his supposed last words being, “You wouldn’t believe me if I told you,” about what he witnessed there. All my life I’d heard that his final utterances were mostly incoherent with some variation on “the army, France, and Josephine” being distinguishable. I didn’t want to call out my friend and embarrass her, but I did send her a link to your blog and would like to say how impressed I am with your obvious scholasticism and research. Thank you for your kind comments about the blog, Paul. I’m glad you are enjoying the site. Of your favourite myths, I have written about the third (see “What happened to Napoleon’s body?“). You have now got me thinking I should do a post on “Top 10 Myths About Napoleon.” There’s certainly no shortage to choose from! Thank you also for your interest in Napoleon in America. I hope you like the book. That mysterious document asserts that Robeaud “was born in this village in 1771…died on St. Helena…” with the date of his death being “illegible.” I sometimes pass these stories on to my students with a few caveats just to entice them into doing research on their own, but I wonder if this story has any basis in reality or was it just plucked out of thin air? I have come across the Robeaud legend, Paul. According to Michael Sibalis (see his excellent “Conspiracy on St. Helena? (Mis)remembering Napoleon’s Exile“), it first appeared in print in 1911, “supposedly derived from the memoirs of a police agent named Ledru (purportedly published in Liège in 1840 but not to be found in any library today)” (Sibalis, p. 3). In 1934, V. Schleiter, député-maire of Verdun, reported that he had investigated the claim and was unable to find that any Robeaud had ever been born in Baleycourt. Still, the legend lives on, appearing in books and blogs of the “incredible but true” variety published as recently as last year. Although this story (about Napoleon emerging horrified from the Great Pyramid) has often been repeated, there are no contemporary witness reports of Napoleon spending time in the pyramid.